Airdate: Dora and Friends: Into the City! Next month Nick Jr. premieres a new animated pre-school series, Dora and Friends: Into the City!, with its ever-popular character, Dora the Explorer. “Dora and Friends: Into the City! expands on Dora’s legacy of being a compassionate leader, friend and role model, in a setting where she can have dynamic peer relationships and experience the world around her in new and exciting ways,” said Teri Weiss, Executive Vice President, Nickelodeon Pre-school. Set in the fictional city of Playa Verde, Dora and her friends set off on magical and real-life adventures. During each expedition, Dora uses Map App on her smartphone and her magical charm bracelet to navigate the city and overcome obstacles. 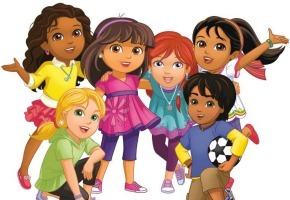 Dora continues to be a good friend, leader, and problem-solver with a group of new friends – Kate, Naiya, Emma, Alana and Pablo – who share her passion for learning and exploring. Developed with the support of educational experts, the show is based on a new, interactive curriculum that focuses on community service, problem solving, emotional skills, Spanish language and Latino culture. Created by original Dora the Explorer creators Chris Gifford and Valerie Walsh Valdes (Dora the Explorer, Go, Diego, Go! ), Dora and Friends: Into the City! will air weekdays at 9.30am on Nick Jr. The Dora the Explorer series, which after 14 years remains one of the most-watched shows on Nick Jr., will also continue to air on the channel. Premiering Monday, 3 November at 9.30am on Nick Jr.